Be able to described the events of inflammation. Explain the triggers of inflammation. Explain the role of phagocytes in inflammation. Describe in detail the events of phagocytosis and the mechanisms that these cells use to detect, attach to, and kill target pathogens. The next time you burn or cut yourself, make a note of the symptoms you observe in the damaged tissue. You will observe swelling, redness, heat and pain. Swelling is caused by the creation of gaps between the capillary cells, allowing the movement of fluid and immune cells to the damaged area. An increase in blood flow to the area causes the characteristic redness. Heat is caused by the accumulation of blood and the release of fever-inducing molecules (called pyrogens). Pain is felt in response to tissue damage and the irritation of sensory nerves in the affected area. This series of events is collectively called inflammation. Figure 15.8. Inflammation. The inflammatory response focuses the attention of the body's repair and immune systems on an area of damage. The body attempts to repel any invading pathogens and then begins the process of repairing the damage. See text for details. Of all the host defenses, inflammation is arguably the most important. It is one of the initial responses to the presence of an invader and focuses the immune system at the site of infection. Inflammation draws phagocytes, which attack and kill the invading microbe and interact with the adaptive immune system to create a long-term response. However, inflammation can cause considerable damage to host tissues, which can be part of the microbial pathogenesis of a disease process. In addition, unwanted inflammation can also be a major destructive force, as seen in many autoimmune diseases. Inflammation can be triggered by damage to host tissue, by certain immunological reactions (such as the complement cascade discussed previously) or by the presence of harmful microbial as well as non-microbial agents. No matter what the cause, induction and maintenance of inflammation follows a similar series of events as shown in Figure 15.8. Injured or dead cells release their cytoplasmic constituents in the surrounding area causing a lowering of the pH. The drop in pH leads to the activation of the extracellular enzyme kallikrein that in turn activates bradykinin. Bradykinin binds to receptors in the cells of nearby capillary walls, opening up intracellular spaces that allow blood constituents, including immune cells, access to the area. Bradykinin also binds to mast cells that are found in association with the small vessels of most tissues. This binding precipitates the release of the mediators of inflammation such as histamine, heparin, prostaglandins, leukotriene and other compounds. This cocktail of chemicals recruits neutrophils, macrophages and leukocytes that destroy the invading particles and help to induce a specific immune response. One of the major results of inflammation is the isolation of the pathogen in a defined area. This often occurs through the formation of a blood clot - the same kind of clot that forms when the skin is cut. This response is a rapid and extremely powerful antimicrobial activity that successfully deals with many infections. An important result of inflammation is the recruitment of phagocytes. These cells function to engulf and attack particles in the host that have been signaled for removal by various mechanisms. In this section we describe the synthesis and properties of phagocytes. Phagocytes originate in the bone marrow from stem cells that first differentiate into myeloid precursor cells. These are a set of intermediate cells that can take a number of paths. Under the influence of various cytokines, the myeloid precursor cells then differentiate into different kinds of phagocytic cells such as polymorphonuclear granulocytes, monocytes and macrophages as shown in Figure 15.9. Polymorphonuclear granulocytes (mostly neutrophils) leave the bone marrow and circulate in the bloodstream and body for only a few days before dying. They are the first phagocytic cells that normally encounter an infection and can rise to large numbers during a severe illness. Monocytes differ from polymorphonuclear granulocytes in that they have an unsegmented nucleus and are much longer lived. This longer existence is critical to their function, as you will see later. After creation in the bone marrow, they circulate in the blood for a period before settling in a tissue and maturing into macrophages. Finally, macrophages are mature monocytes that are attached to lymph tissues and can be up to ten times the size of monocytes. All phagocytes contain membrane vesicles filled with destructive and degradative compounds (lysosomes) that are available for the annihilation of engulfed microbes. Figure 15.9. Phagocytes, Neutrophils, Macrophages and Monocytes. Phagocytes are the cellular sentries of the immune system, detecting, engulfing and killing pathogens in our bodies. They also destroy dead or dying cells and cancerous cells. Phagocytes are motile and roam throughout the bloodstream, the lymphatic system and non-vascular tissue in search of particles to assault. When a non-self particle is encountered, it is taken into the phagocyte, combined with destructive compounds and destroyed. This process, termed phagocytosis, involves several discrete steps as listed below and diagrammed in Figure 15.10. Detection of the foreign particle and movement of the phagocyte to the area. Attachment of the foreign particle to the phagocyte. Engulfment or ingestion of the foreign particle into a vesicle called a phagosome. Fusion with lysosome and formation of the phagolysosome. In the case of macrophages, egestion and antigen presentation. Figure 15.10. The process of phagocytosis. The steps of phagocytosis, detection/chemotaxis, attachment, engulfment, fusion, and killing. Macrophage are also capable of egestion and antigen presentation. For the sake of simplicity, we will focus on the example of the attack of a phagocyte on a microorganism. However, the process is similar when a phagocyte attacks a virus or other foreign particle. The presence of an infecting microbe sets into motion a number of host responses, one of them being inflammation. This in turn regulates adhesion of phagocytes to blood vessel walls that allow the migration of phagocytes across vascular walls. Once inside an infected tissue, phagocytes must then detect the location of a microbe, which can be signaled in a number of ways. Many microbial proteins contain N-formyl methionine at their amino terminal end, while eukaryotic proteins do not. Certain N-formylated bacterial peptides serve as chemoattractants for phagocytes. The binding of antibodies to antigens triggers the classic complement pathway with subsequent release of C3a and C5a. These proteins are also chemoattractants for phagocytes. The complement cascade also induces an inflammatory response, whose mediators of inflammation also draw phagocytes to the area. From these three examples, it is obvious that the body creates a number of strong signals in response to microbial invasion, and that these signals quickly draw phagocytes to the area of infection. The rapid removal of microbes is critical in preventing a disease and having multiple attractants insures a swift reaction. The phagocyte must then attach to the target microorganism. Without assistance, this can be a somewhat inefficient task for the phagocyte. In the absence of help, phagocytes are still capable of binding to microorganisms by a mechanism that can be thought of as nonspecific attachment. This nonspecific attachment probably involves electrostatic or hydrophobic attraction between the phagocyte and microorganism. It is also possible for the phagocyte to physically trap the microbe against a tissue surface and initiate ingestionâ€”a mechanism called surface phagocytosis. These nonspecific mechanisms of attachment are probably important early in infection to slow the microbe's progress, but they will not stop an infection.The immune system has a number of ways that make the process of phagocytosis more efficient. Phagocytes have over 40 specific types of receptors on their cell surfaces. Some of these receptors are for chemoattractants that draw phagocytes to an area; others recognize molecules that enhance the binding of phagocytes to their targets. This enhancement of binding is termed opsonization and macromolecules that bind to a microbe and increase the efficiency of phagocytosis are opsonins. Opsonins provide molecular handles for the phagocyte to grab onto. Several different macromolecules can serve as opsonins for phagocytes. IgG antibodies have a site on their constant region that can react with an antibody binding receptor on phagocytes. This phagocyte-binding region is masked in a free antibody, but becomes accessible to phagocytes when the antibody binds to antigen. Initially, masking this site prevents free antibody from binding to phagocytes. The complement protein C3b can also serve as an opsonin. Whether triggered by the classic, lectin or alternative pathway, C3b eventually binds to the membrane surface of the complement-activating microbe. Phagocytes contain a C3b receptor, which binds to C3b and thus to the microbe containing it. Opsonization of bacteria greatly increases the rate of attachment and ingestion by phagocytes. Bacteria in the blood are quickly cleared only if they are bound by opsonins. Attachment of the microbe to the phagocyte results in some sort of signal (the nature of which is still not clearly understood) that triggers ingestion of the microbe. Ingestion involves encircling the target particle with phagocytic membrane so that it is eventually taken inside the cytoplasm of the phagocyte engulfed in a membrane vesicle called a phagosome. This process requires ATP and is triggered by the attachment of the target to the phagocyte's cytoplasmic membrane. Contact between a microbe and a phagocyte also changes the phagocyte's metabolism from aerobic respiratory to anaerobic fermentative, with lactic acid being the final end product. The increase in lactic acid in the phagocyte lowers the pH of the cytoplasm, including the phagolysosome and this enhances the activity of many of the degradative enzymes present. The phagosome containing the microorganism migrates into the cytoplasm and soon collides with a series of lysosomes forming a phagolysosome. When the membranes of the phagosome and lysosome meet, the contents of the lysosome explosively discharge, releasing a large number of toxic macromolecules and other compounds into the phagosome. The killing processes inside the phagolysosome are confined to the organelle of the phagolysosome, thus protecting the cytoplasm of the phagocyte from these toxic activities. Several minutes after phagolysosome formation, the first detectable effect on the microorganism is the loss of the ability to reproduce. Inhibition of macromolecular synthesis occurs sometime later and many pathogenic and non-pathogenic bacteria are dead 10 to 30 minutes after ingestion. The mechanisms phagocytes use to carry out this killing are diverse and complex, consisting of both metabolic products and lysosomal constituents. Each type of phagocyte (neutrophils, monocytes or macrophages) has a slightly different mix of killing methods. The killing mechanisms that phagocytes use can be organized into two broad groups: oxygen-dependent and oxygen-independent mechanisms. Figure 15.8 shows the killing mechanisms of phagocytes. Figure 15.11. Killing Mechanisms of Phagocytes. The figure shows the many different techniques used by phagocytes to kill pathogens. Some require oxygen while others do not. As will be discussed later, antibodies have constant regions on them that phagocytes can bind using Fc receptors. Binding of Fc receptors on neutrophils, monocytes and macrophages (also binding of mannose receptors on macrophages) causes an increase in oxygen uptake by the phagocyte called the respiratory burst. This influx of oxygen is used in a variety of mechanisms to cause damage to microbes inside the phagolysosome, but the common theme is the creation of highly reactive small molecules that damage the biomolecules of the pathogen. Binding of these receptors activates an NADPH oxidase that reduces O2 to O2- (superoxide). Superoxide can further decay to hydroxide radical (OH.) or be converted into hydrogen peroxide (H2 O2) by the enzyme superoxide dismutase. In neutrophils, these oxygen species can act in concert with the enzyme myeloperoxidase to form hypochlorous acid (HOCl) from H2 O2 and chloride ion (Cl-). HOCl then reacts with a second molecule of H2 O2 to form singlet oxygen (1 O2), another reactive oxygen species. Macrophages in some mammalian species catalyze the production of nitric oxide (NO) by the enzyme nitric oxide synthase. NO is toxic to bacteria and directly inhibits viral replication. It may also combine with other oxygen species to form highly reactive peroxynitrate radicals. All of these toxic oxygen species are potent oxidizers and attack many targets in the pathogen. At high enough levels, reactive oxygen species overwhelm the protective mechanisms of the microbes, leading to their death. The pH of the phagolysosome can be as low as 4.0 and this alone can inhibit the growth of many types of microorganisms. This low pH also enhances the activity of lysozyme, glycosylases, phospholipases and nucleases present in the phagolysosome that degrade various parts of the microbe. A variety of extremely basic proteins present in lysosomal granules strongly inhibit bacteria, yeast and even some viruses. In fact, a few molecules of any one of these cationic proteins can damage the membranes of a bacterial cell, causing death by an unknown mechanism. The phagolysosome of neutrophils also contains lactoferrin, an extremely powerful iron-chelating agent that sequesters most of the iron present, potentially inhibiting bacterial growth. Monocytes and macrophages also secrete a number of the following substances that may play a role in killing pathogens. Oxygen metabolites such as O2-, H2 O2, NO and OH. are also secreted into the local environment when the cells bind an Fc receptor on an antibody or when activated by α-interferon. Prostaglandins are vasodilators and may increase vascular permeability that accompanies infection and inflammation. Monocytes are responsible for the synthesis and secretion of many complement components, which then circulate in the blood and lymph as potent antibacterial factors. Stimulation of macrophages by endotoxin causes the synthesis and secretion of interleukin-1 (IL-1). IL-1 along with other cytokines, such as IL-6, stimulates T-lymphocytes to proliferate, thus assisting in the activation of the rest of the adaptive immune system. IL-1 also serves as a chemoattractant for neutrophils and keeps them at the site of inflammation by enhancing the adhesiveness of endothelial cells for neutrophils. Once a microbe is killed, the phagolysosome employs a large collection of digestive enzymes (e.g., lysozyme, proteases, lipases, nucleases, and glycosylases) that break bacterial macromolecules into low molecular weight components. In neutrophils, spent phagolysosomes accumulate in the cytoplasm and the phagocyte eventually lyses and dies. Dead neutrophils make up most of the material in pus. Macrophages and monocytes live much longer than neutrophils and must dispose of their bacterial components. Once microorganisms are destroyed, the unwanted organic material is expelled from the cell in a process called egestion. Egestion is the opposite of ingestion and the molecular mechanism is basically the reverse of phagocytosis with the microbial leftovers being dumped into the blood and lymph. Some of this microbial debris is not egested, but binds to special protein complexes (called Major Histocompatibility Complex (MHC) molecules) on the membranes of macrophages for presentation to the immune system, as we will discuss when we cover adaptive immunity. We end this section with a set of cells that do not fit neatly into either innate or adaptive immunity and these are the natural killer cells. They are a group of nonphagocytic granular lymphocytes present in the body at low populations and containing small amounts of immunoglobulin and MHC I molecules on their surface. Natural killer cells are not T cells, but their behavior is similar to that of cytotoxic T cells. However, natural killer cells are found in animals never exposed to relevant antigens, which suggests that they are not inducible. This is in contrast to T cells that increase in number when exposed to activating antigen. Natural killer cells have Fc receptors on their surface that are capable of binding IgG, which have been shown to trigger antibody-mediated cytotoxicity. While they tend to defy easy classification, it is clear that natural killer cells are responsible for recognizing and destroying virally infected cells, bacteria, fungi, protozoa, helminths and tumors and are, therefore, an important defense against pathogens. Inflammation occurs in response to tissue damage, either through injury or from infection. In the case of an infection, inflammation causes the activation of the immune response. A key part of this immune response is phagocytes that move about the body, are recruited and activated by inflammation, attach to invading pathogens, engulf them, and kill them. Neutrophils, monocytes and macrophages are the three major types of phagocytes. Phagocytes detect microbes by the presence of N-formylated peptides, activated complement proteins and the mediators of inflammation. Phagocytes attach to microbes using opsonins, such as IgG and the complement protein C3b. In the absence of opsonins, phagocytes can still attach to target microbes nonspecifically, but the process is not as efficient. 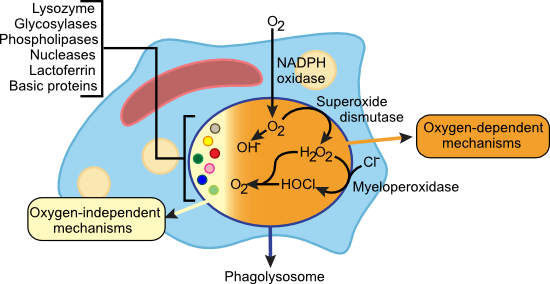 After binding, phagocytes internalize their prey and fuse them to a lysosome, forming a phagolysosome. Once inside the phagolysosome a large collection of oxygen-dependent and -independent mechanisms are used in an attempt to kill the microbe. Finally, natural killer cells are part of innate immunity, but respond in a fashion similar to T cells. They attack cells coated with IgG and attempt to kill them.